HeadStart QuickSource® reminds us that Creative Arts Expression engages children's minds bodies and senses by allowing for creative and imaginative expression in music, art, creative movement, and drama. "The arts invite children to listen, observe, discuss, move, solve problems, and imagine using multiple modes of thought and self-expression. The creative arts provide ways for young children to learn and use skills in other domains. In the domain of Creative Arts Expression, programs need to ensure that children who are dual language learners can demonstrate their abilities, skills, and knowledge in any language, including their home language." Here's an activity called Colorful Nature Collages that gives children the opportunity to express their creativity and explore color with materials from nature. For this activity, you will need natural materials such as leaves, berries, tree bark, grass, and seashells. You'll also need poster board, constuction paper or No Glue Collage Boards, glue, paper bags, and markers. Write the name of a color with a matching marker on each of the paper bags. Select colors that children will find in nature – brown, green, red, gray, black, etc. Invite each child to select a paper bag. Explain to the children that they will go on a nature walk to find materials in nature that are the same color as marked on their bag. Encourage the children to collect leaves, twigs, rocks, berries, tree bark, etc. and put the materials in their bag. 1. After the children return to the classroom, invite them to share some of the materials they found on their hike with the other children. 2. Give each child a piece of construction paper or poster board and glue. Or, you can use collage boards. 3. Invite the children to create a colorful nature collage using the materials they found on the hike. 4. 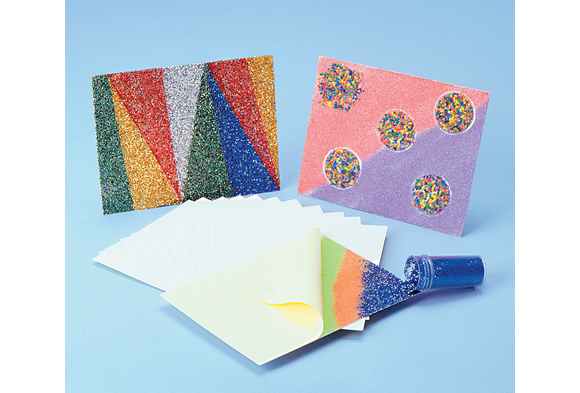 Once the children have finished gluing their materials to their poster board, construction paper or collage board, allow the collage to dry and hang in the classroom. 5. Be sure to label the collage as Sarah's Red Collage, Jimmy's Green Collage, etc. Most likely the children will have extra collage materials. Put all of the leftover materials in a pile and encourage the children to make another collage. Invite the children to create a collage of similar textures, shapes, or sizes. If using POCET™, this activity corresponds with the devlopmental guidelines shown in CA5: Explores Drawing, Painting and Modeling with Different Materials and Media. Environmental QuickSource® reminds us that "Children will re-discover the gifts of nature as they become a source of classroom fun, and they’ll learn that taking small steps today will provide for a healthier environment tomorrow." 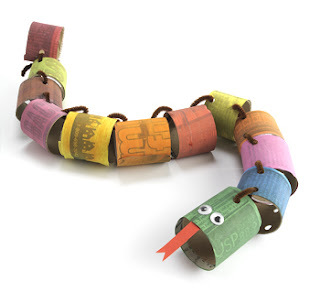 A fun, Eco-friendly activity to reinforce what children have learned about snakes and to build team-work. For this activity, you will need Colorations® Washable School Glue (SCWG), Colorations® Simply Washable Tempera Paint (WST), Fiskars® 5" Preschool Scissors (FSKPS), Colorations® Plastic Handle Jumbo Chubby Paint Brushes (BTPB), Black Self-Adhesive Wiggly Eyes (100BA), a One Hole Punch (OHP), Tipped Lacing Yarn (YARNTIP) and Pipe Cleaners (PPIPE). 1. Review unit on snakes. Point out key facts about snakes such as how they eat, how they move, and especially what kind of skin they have, etc. Let children look through books or pictures of different kinds of snakes and point out differences and similarities between the scale patterns and colors. 2. Cut the collected paper towel rolls into 2” pieces. 3. Cut the collected newspaper into 2” wide strips and long enough to wrap around the tube. 4. Have the children wrap the newspaper strips around the tubes and glue into place. 6. Punch holes with the hole punch in each side of the tube, two holes at each end, across from each other. 7. Have the children tie the painted sections together by using string laced through the punched holes (or twist pipe cleaners if the children are not able to make knots). The snake can be as long or as short as the children want. Let them decide if they want to alternate certain colors, or make any other patterns with the colored sections. 8. When the snakes are complete, have the children decide which end is the head and stick a pair of wiggly eyes (or draw the eyes with marker) on the head. Slightly flatten the tail end so it comes to a point. Let the children move the snake in different ways that snakes move - slithering, inching, gliding, jumping, etc. The snake is great for hanging around the classroom as decoration or for using as a measurement tool. If using POCET™, this activity correlates to Developmental Guideline: CA6: Plans and Works Independently through the Process of Art Activities.